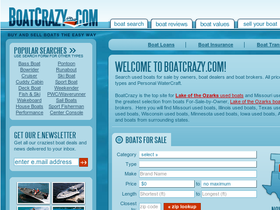 Boat Crazy, online at BoatCrazy.com, is the perfect place to buy and sell boats the easy way. Search for all types of boats including bass, bowrider, cruiser, cuddy cabin, deck, fish & ski, wakeboard, house boats, performance, pontoon, runabout, ski boat, sport boat, weekender, PWC/waverunner, sail boats, sport fisherman, and more. At Boat Crazy, you can also purchase boat loans, boat insurance, boat transportation, or you can sell your own boat. When you register your boat for sale here, your ad will be run until it is sold. Head over to Boat Crazy for the simplest way to buy and sell boats, and check out RetailSteal.com for all the greatest Boat Crazy savings, Boat Crazy discounts, and Boat Crazy promotions. See BoatCrazy.com for shipping details, rates, and information. Make a listing to sell your boat for as low as $39 if your selling price is under $10,000. Click link now. List and sell your boat on BoatCrazy.com -- there are no monthly fees or commissions. Click link to start. Renew your ad for free every 60 days on BoatCrazy.com. Click link to start. Your ad runs on BoatCrazy.com until your boat is sold. Click link now to start.